"What is this thing called Democracy? Google the question and you will exceed one million hits. But for an honest and illuminating answer, read this book—every single word. Searching, lucid, visionary, Astra Taylor takes a deep oceanic dive into the history, meaning, uses, and promise of democracy—moving from Plato’s Greece to Syriza’s Greece, from the Global South to post-Communist East, from slavery to fascism, liberalism to neoliberalism, Occupy to the Commons. She knows what most political scientists don’t: that democracy is a promise unfulfilled, and in our strivings to achieve it nothing is guaranteed. But we can’t live without it." 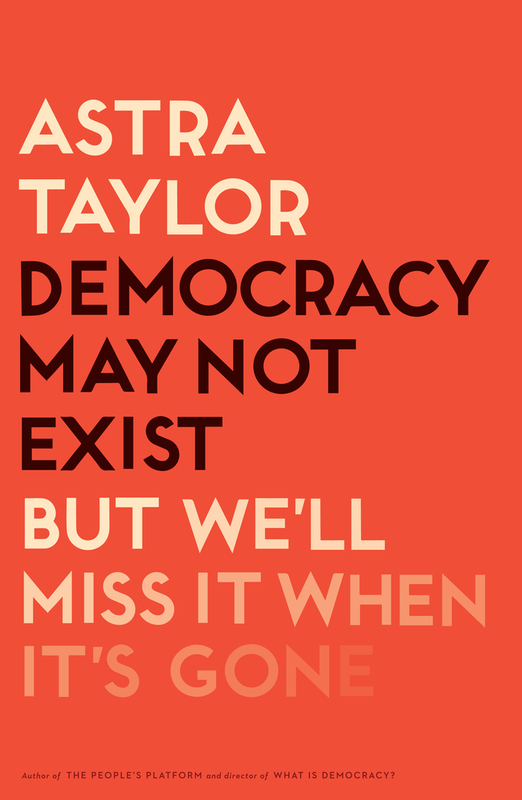 Astra Taylor is the author of The People's Platform (winner of the American Book Award) and made two documentary films, Zizek! and Examined Life. Taylor’s writing has appeared in the New York Times, the Washington Post, n+1, and The Baffler, where she is a contributing editor. She lives in New York City.